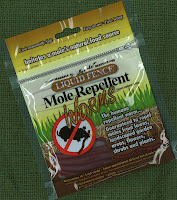 Mole Repellent Worms are a dead give-away for the real thing - earth worms, a mole’s favorite food. But once they eat just one, the mole’s normal digestion goes amuck, and they won’t return for a second helping. That’s because these biodegradable ‘real food’ worms are impregnated with the active ingredient found in lab-tested and proven effective Liquid Fence® Mole Repellent -- guaranteed to virtually eliminate moles and the tunnels they create in lawns, landscaped garden areas and flowerbeds. 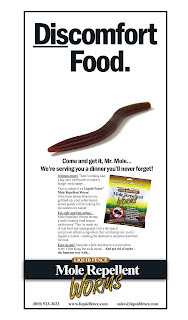 Earth-friendly Mole Worms were developed in partnership with FoodSource Lure Corporation, one of the leading developers of commercialized fishing lures. For more information about sending moles packing, visit The Liquid Fence Company or call 888-923-3623.